July 2000 - Present Director of Diversity and Minority Affairs. North Carolina State University College of Veterinary Medicine, Raleigh. July 2000 - June 2003 Director of Diversity and Minority Affairs/Ruminant/Food Animal Medicine Clinical Assistant Professor. North Carolina State University College of Veterinary Medicine, Raleigh. July 1997 - June 2000 Ruminant Medicine Clinical Instructor/ Minority Coordinator. North Carolina State University College of Veterinary Medicine, Raleigh. July 1995 to June 1997 Ruminant/Food Animal Medicine Residency. North Carolina State University College of Veterinary Medicine, Raleigh. Dr. Elaine Hunt. July 1994 to June 1995 Rotating Large Animal Internship. University of Tennessee College of Veterinary Medicine, Knoxville. Dr. Fedrico Latimer. Outstanding Service Award, Veterinary Medical Assistance Team, December 2002. Resident of the Year, Elected by NCSU-CVM Class of 1997. Phi Zeta Honor Society of Veterinary Medicine, Inducted April, 1997. Honorable Mention, Resident of the Year, Elected by NCSU-CVM Class of 1996. Eastern Shore Veterinary Scholarship, Tuskegee University, 1994. "Most Valuable Senior", Tuskegee University, Presented by Junior Class, 1994. "Outstanding Service" Award, Presented by Human Animal Bond/Animal Behavior Club, Tuskegee University, 1994. Pfizer "Outstanding Student Representative" Award, Tuskegee University, 1993. Class of 1994 President, 1990-1991. Student Government Association President, Germanna Community College, 1985. Ruminant Health Management. North Carolina State University, July 1995 to June 2003. Provide clinical instruction (VMF 970) to senior veterinary students. Clinical teaching included application of decision-making strategies typically used in practice. Daily clinical round involved discussions on patient care, practice economics, herd health management common diseases and treatment options. Also provided instruction as primary and back-up clinician for house officers and students during emergency duty coverage for ruminants and pet pig patients. Designed, edited and produced multiple client education brochures to inform owners about various caprine, ovine, lama, pet pig, and bovine health care issues. Provided clinical instruction to veterinary students from the US and Canada on potbellied pig health management at the annual special species symposium. The lab included teaching pet pig restraint, and handling, vaccination techniques, hoof and tusk trimming, castration and spaying, etc. Ruminant Special Topics. North Carolina State University, July 1997 to June 2004. Provided clinical instruction (VMF 987) to senior veterinary students. Clinical teaching included application of advanced decision-making strategies used in referral hospitals and general practice situations. Daily clinical activities included but were not limited to patient care, discussing practice economics, herd health management common diseases, treatment options and emergency duty coverage for small ruminant patients. Special Topics Selective/Elective. North Carolina State University, April 2004 to May 2004. Provided clinical instruction (VMF 991) through special selective/electives offered to veterinary students interested in learning about small ruminants. The course involved two weeks of intense clinical training. They attended lectures and participated in specific field service call providing them clinical opportunities to learn about small ruminant veterinary practice. Special Topics Selective/Elective. North Carolina State University, January 2002 to June 2003. Provided clinical instruction (VMF 991) through special selective/electives offered to veterinary students interested in learning about potbellied pigs. The course involved two weeks of intense clinical training. They received lectures from pet pig nutritionists, private practitioners, surgeons and anesthesiologist faculty etc. Students were required to attend the annual potbellied pig symposium to gain maximum exposure and experience during this experience. Small Ruminant TAU Laboratory Instructor. North Carolina State University, July 1995 to June 2004. Taught labs (VMF 916, 936,and 956) to first, second and third year vet students. These consisted of various small ruminant dehorning, castration, pregnancy diagnosis by ultrasound, vaccinations, foot trimming, tail docking, sheering, crutching, stomach tubing, tuberculosis testing and blood collection. Ruminant Medicine. North Carolina State University, July 1995 to March 2002. Provide lectures on Lama and Potbelly Pig Medicine (VMF 962) to third year veterinary students. Introduction to Farm Animal Diseases. North Carolina State University, July 1996 to June 2004. Gave exotic farm animal disease and small ruminant herd health programs lectures (VMF 420) to North Carolina State University undergraduate student in College of Agriculture and Life Sciences. Also gave (3) basic nutrition (VMF 062) lecture to North Carolina State University undergraduate student in College of Agriculture and Life Sciences. Ruminant Food Animal Medicine and Surgery Lab Instructor. North Carolina State University, July 1995 to October 2000. Taught bovine hoof care laboratory (VMF 965) to third year veterinary students. Lab included techniques in restraint using hydraulic table foot trimming, claw amputation, interdigital fibroma removal, hoof block and cowslip application. Rotating Large Animal Lab Instructor. University of Tennessee, July 1994 to June 1995. Taught equine vaccination, blood collection and naso-gastric intubation labs for senior animal science students. Also taught bovine physical exam, vaccination, blood collection, oral bolusing and gastric intubation labs for senior animal science students. Breitschwerdt E., Sontakke S., Cannedy A., Hancock S., Bradley J. March (2001). Infection with Bartonella weissii and Detection of Nanabacterium Antigens in a North Carolina Beef Herd. Journal of Clinical Microbiology Vol 39, No. 3, p 879-882. Rohrbach, B. D., Cannedy, A. L., Freeman, K., & Slenning, B. S. (1996). Peripartuient diseases as predisposing risk factors for abomasal displacement. JAVMA Vol. 214, No. 11, pp. 1660-1663, 1999. White C, Cannedy A.L., DVM; An Introduction to Llamas, NCSU- CVM CE Brochure, January 1997. Monroe S, Cannedy A.L., DVM; You and Your Potbellied Pig, NCSU- CVM CE Brochure, April 1997. Goat Management Greene County, North Carolina, March 23, 2004. Presented lectures to producers on caprine herd health management techniques. Had discussions about prepurchase evaluations, vaccination programs, nutrition, parasite control, etc. Iverson Bell Symposium Mayflower Hotel, Washington, DC March 2001 and 2003. Presented seminars on issues concerning diversity at veterinary medical colleges. Gave seminar on diversity admissions and employments trends at veterinary medical colleges. Was responsible for presenting data collected from survey developed by the AAVMC multicultural affairs committee at the 2003 symposium. Veterinary Medicine 'A Rainbow of Choices' North Carolina , June 2000 - Present. Present regularly scheduled career workshops to (7) North Carolina School informing middle and high school student about various career opportunities that exist in the veterinary profession. These schools were selectively targeted because of their high percentages of minority student enrollment. NCSU-CVM House Officer Diversity Awareness Seminar Raleigh, North Carolina, July 2002. Presented seminar to incoming interns and residents about the importance of diversity in the veterinary medical colleges and the veterinary profession. Raise awareness of the positive benefits that diversity could provide to a non diverse group of professional in training. The presentation and discussion provided a very enlightening experience for everyone that was require to attend the seminar. NCSU-CVM Brown Bag Luncheon Raleigh, North Carolina, November 2002. Lead discussion on diversity issues and concerns about lack of minority presence within the veterinary college environment. Facilitated question and answer session for group of CVM employees attending this voluntary program. Diversity Awareness for Career and Life Skill Raleigh, North Carolina, August 2002. Lead discussion on diversity issues and concerns about lack of minority presence within the veterinary college environment. Facilitated question and answer session for group of first year CVM students attending this required program. North Carolina Veterinary Technician Association Conference. North Carolina State University College of Veterinary Medicine. February 2003. Presented lecture on small ruminant health management to veterinary technicians at their annual conference held at NC State University. Primary focus was on caprine herd health and emergency care. Presented lectures on common kid diseases, with primary focus on floppy kid disease, caprine mastitis and parasite management. Also provided a wet lab for laypersons that allowed for hands on experience giving injections, dewormers and foot care. North Carolina Veterinary Medical Association Conference. Sheraton Conference Center, Research Triangle Park, North Carolina. November 1996, 1997, 1998, 1999, 2002. Presented lecture on llama health management with lab held at the Veterinary Teaching Hospital at NC State University. Lab consisted of physical examinations, blood collection, intravenous catheterization, toe trimming and stomach tubing. Gave additional lectures on potbelly pig care, caprine urolithiasis, bovine abomasal displacement and caprine herd health programs. Served as the North Carolina Veterinary Conference (NCVC) Ruminant Committee Chairperson 2000 - 2003. Responsible for organizing and conducting the ruminant program for the NCVC. Gave continuing education presentations on to attending veterinarians on caprine urolithiasis, potbellied pig medical management and lama health care at the College of Veterinary Medicine. Presented lectures on caprine parasite control to the regional groups of meat goat producers at a day long workshop for the Virginia Agricultural Extension Service. South Carolina Association of Veterinarians Annual Winter Conference. Hyatt Regency Conference Center, Greenville, South Carolina, January 2002. Gave lectures on llama herd health, caprine herd health management and caprine prepurchase evaluations. University of Melbourne Veterinary College. Melbourne, Australia, May 2000. Presented lecture on caprine urolithiasis to veterinary students, faculty and visiting veterinarians. Tuskegee University Annual Veterinary Medical Symposium. Tuskegee, Alabama March 9, 2002. Gave lectures on caprine zoonotic diseases, kid care, caprine herd health management and caprine prepurchase evaluations. Symposium on Animal Rescue and Shelter Medicine & Management Raleigh, North Carolina, March 23, 2002. Gave lecture to animal rescue group on small ruminant health care needs in rescue situations. Bovine Education Symposium. North Carolina State University, January 1996. Participated in 1996 educational symposium consisting of numerous, herd visits and food animal educational tours. Assisted in conducting group and individual discussions with animal science and veterinary students on various management and disease processes encountered during the trip. Diversity Awareness Study. North Carolina State University, 2003. Designed and issued survey to all North American Veterinary Colleges querying diversity awareness at their individual institutions. Fenbendazole Study. North Carolina State University, 1997. Dr. Elaine Hunt. Performed research study investigating potential toxic side effects produced from Fenbendazole therapy treated pre-ruminant calves. Abomasal Displacement. University of Tennessee, 1995. Dr. Barton D. Rohrbach. Conducted research project evaluating abomasal displacement in bovine and associated periparturient diseases as potential predisposing factors to displaced abomasum. Milk and Soil Lead Research. Tuskegee University, 1993. Dr. Abu Kahn. Collected milk and soil samples from locations in the state of Virginia to investigate lead residue levels present in milk and soil samples. Plastination Research. Tuskegee University, 1990. Dr. Abdula Eljack. Conducted plastination research project. Prepared and produced several specimens for instructional purposes using the newly developed plastination procedure. Swine Nutritional Study. Virginia State University. 1987 to 1989. 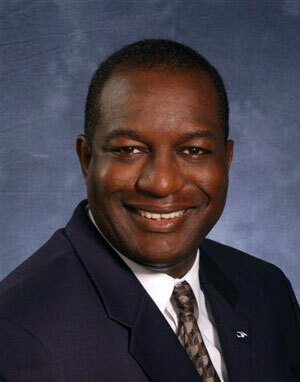 Dr. Michael Ezekwe. Compared birth weights of piglets from sows fed high fructose diets to those from sows fed regular commercial diets. Farrowing House Study. Virginia State University, 1987 to 1988. Dr. Michael Ezekwe. Conducted research designed to evaluate litter size to weaning ratio using specially designed portable swine farrowing houses. Student Tutorial Education Program (STEP) Volunteer weekly at Frances Lacy Elementary School tutoring disadvantaged students. Started spring 1997 to Present. Annual Martin Luther King Jr. Festival. Volunteer participant annually since 1997. Organized recruitment booth for NCSU-CVM. "A Career in Veterinary Medicine". Presentation made to high school students at Virginia State University Career Day Program. Spring, 1996. "The Animal Science Major: Preparation for Veterinary Medicine". Panel presentation at summer transition program for minority high school seniors preparing to enter college. University of Tennessee, Knoxville. Summer, 1994. Participated in PUPS Program (Pets Uplifting Peoples' Spirits). Sponsored by the Human Animal Bond/Animal Behavior Club. Evaluated animals to determine eligibility for participation in the PUPS program. Supervised routine visits in nursing homes and veterans' administration hospitals. Assisted in creating a promotional video, "The Tuskegee Behavior Test for Selecting The rapy Pets", explaining the evaluation procedure for animal selection for PUPS program. Tuskegee University. 1992-1994. Career Speaker; GROW (Germanna Regional Outreach Workshop). Participated in career presentation series for high school minority sophomores and juniors as part of the summer outreach program for area youth. Germanna Community College. Summers, 1990 and 1991.